Zara is worried about Ayesha’s words and says I am so stranger now that mother threatened to throw me out? Kabir hears it and hugs her. Kabir says you are never a stranger, all are worried. Zara says I know but think about your sister’s happiness. Kabir says enough, I wont let her marry Amir, how could she talk about love? I have decided. Zara says Alina will not be happy. Kabir says our parents married us but we are happy now. Zara says thats separate case. Kabir smiles at her and says no, once she marries Anas and will be happy to know that I was right, Amir is a fluke, she will forget him soon. He leaves. Zara looks on. In morning, Alina offers prayer and says God show me a way, I am not doing anything wrong, you made me love him. Alina gets Amir’s message that I cant bear all this, lets run and have a new life, I will wait for you at bus stand. Alina recalls Zara’s words that love marriages are not wrong and she is not doing a sin. Alina wipes her tears and leave. Shahbaz says to Ayesha that Anas’s father messaged. Kabir says I want to talk to Alina again, I will make her listen that this is a good proposal. Zeenat comes there and says Alina is not in her room, did she run? All are shocked. Shahbaz says look around. Zara messages her. Ayesha looks at her and says you made her run right Zara? Zara says what? Ayesha says you provoked her, where is my Alina? Zara says I dont know. Kabir stops Ayesha. Ayesha says she made Alina believe that love marriages are not wrong. Kabir asks Zara where is Alina? Zara says I dont know. Shahbaz says its about our respect. Zara says I told her to not take such decision, she warned me to runaway but I asked her not to. Zeenat says she knew about it and didnt tell us. Kabir says nobody did love marriage in our house and it will not happen now. Kashan says she must be with Amir. Amir looks at divorce papers and says maybe I am wrong, I came in Alina’s life and destroyed it, I wont do anything that will hurt Alina and her family, I will give them divorce papers and end it. Kabir calls him and asks where is his sister? Amir says she is not with me, Kabir says dont lie. Amir says I am not lying. Kabir ends call and says he is lying that she is not with him. Zara thinks if Alina is not with Amir then where she is? Alina comes to bus stand and tries to call Amir but its busy. She gets Amir’s call and says I am waiting at bus stand, you messaged me to come here. Amir says I didnt message you. alina says then who messaged you? I am coming there, dont go anywhere with anyone. He calls Zara and says I got to know about Alina. Kabir takes call. Amir says come to bus stand. Kabir ends call. Zara says what happened? Kabir says you provoked her to runaway from house? you did that with my little sister? He drags her and puts her in car and drives away. Zeenat smirks. Amir comes to bus stand, his phone falls down. Alina is looking around. She finds Amir and runs to him, she hugs him. Tum hi ho plays. Alina shows him message. Amir says its not my number, lets leave. Kabir comes there and grabs Amir. He glares at him. Kabir starts beating Amir but Alina pushes him away and stands infront of Amir. Amir says you are thinking wrong. Alina says enough, she pushes Kabir away. He is stunned and pulls her back. He drags Alina to car. PRECAP- Kabir says to family that my education doesnt allow me to raise hand on my sister or wife but I have to do something. He punches wood. Zara screams Kabir. Ayesha says to Irfan that your daughter is destroying our house, take her away. 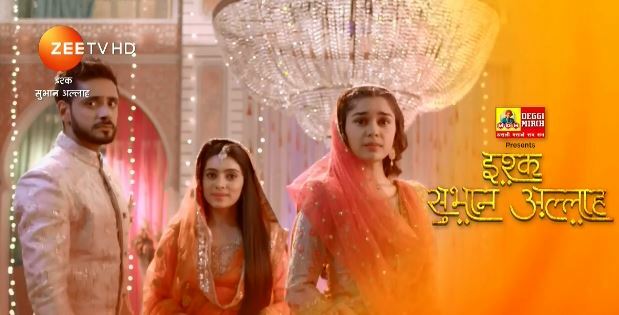 The post Ishq Subhan Allah 20th February 2019 Written Episode Update: Kabir accuses Zara appeared first on Telly Updates.